In previous units we have explained how to design the place (Didactic unit 2), and how to prepare the land from scratch to create our edible garden (Didactic unit 3) and edible garden forest (Didactic unit 4). Now it is time to deal with their maintenance. 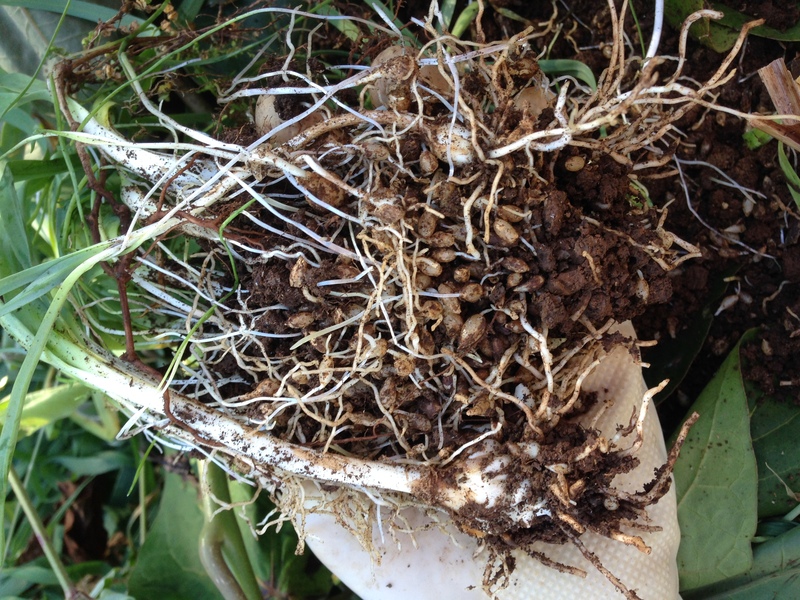 The initial nutrition we applied to the soil plays a crucial role in maintenance. 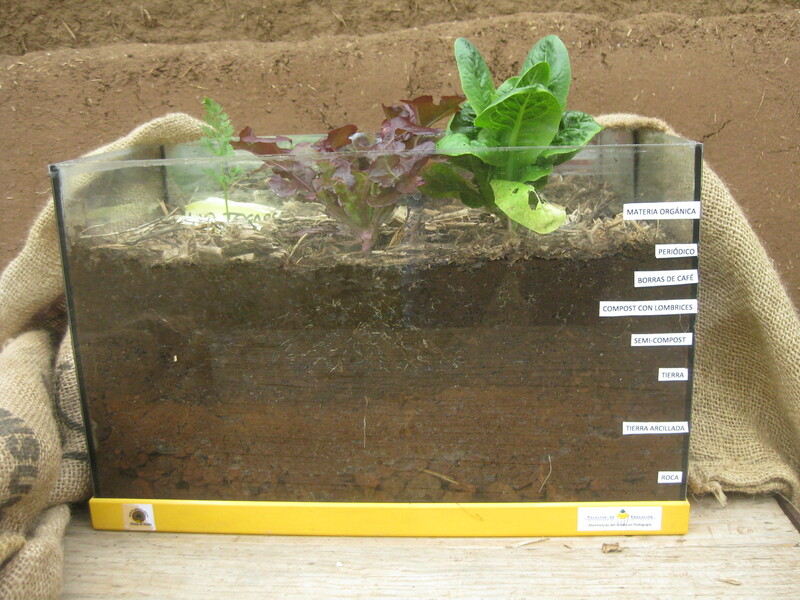 We will identify this issue with concepts such as soil´s skin and surface compost. 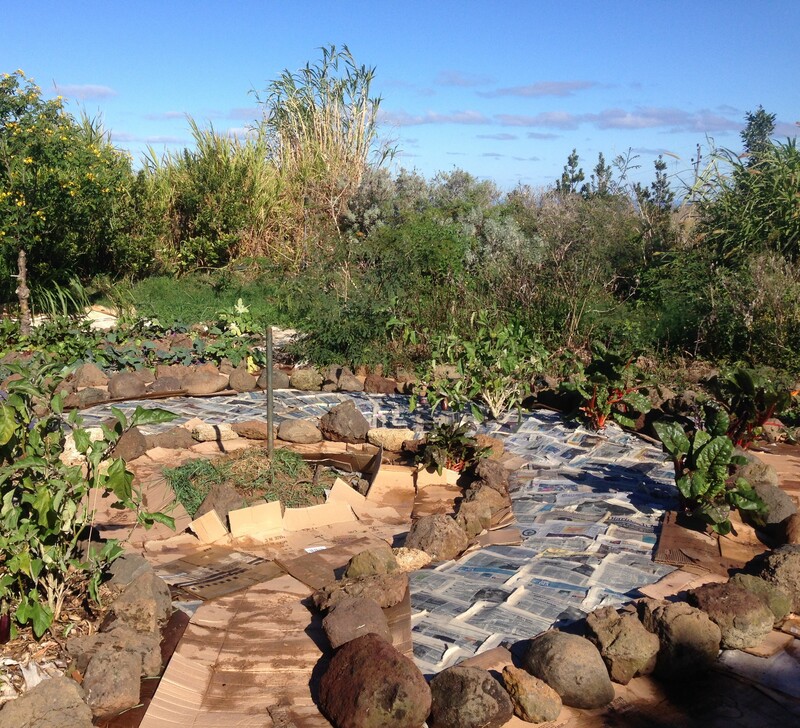 The approximate one-year experience of trial and error after starting ours edible garden and garden forest provides numerous opportunities to notice the need for change, especially taking into account the benefits of the people we work with. 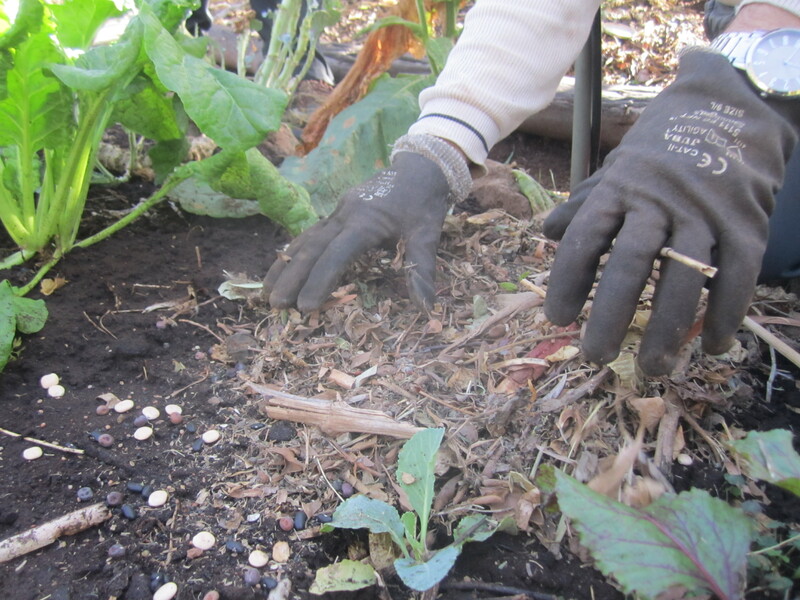 By observing the soil, we can see that the mulch and the newspaper or cardboard used at the beginning have decomposed and therefore we can start to notice the dark tone of the soil (Figure 5.1). 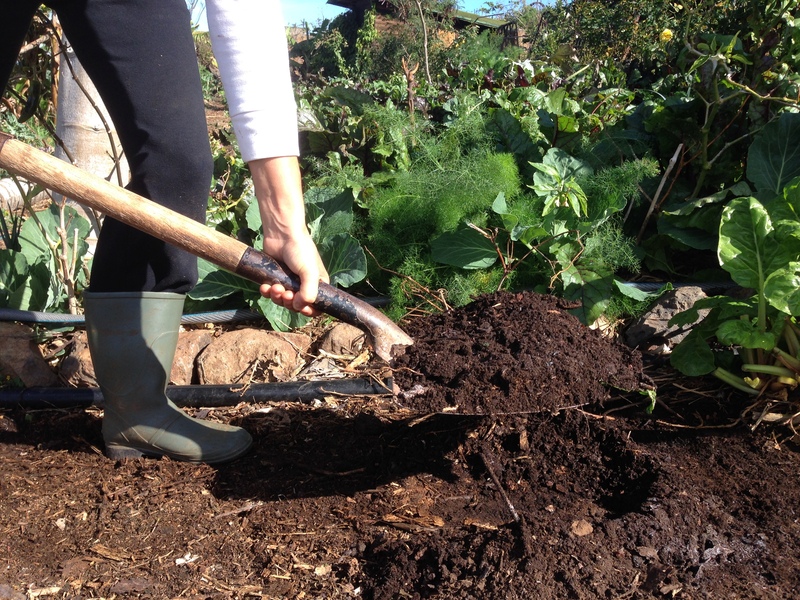 When the soil loses some of its cover, which is its protection, it loses humidity and life, turning into a dry, faded, cracked and hard soil. It is better to avoid reaching this situation even though it is possible to reverse and recover. 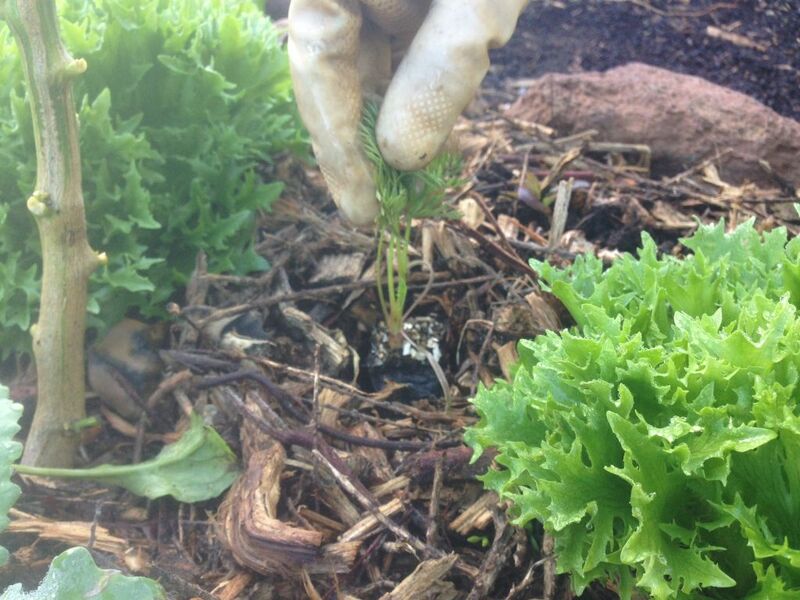 When we start to notice small, bared areas in the mulch, this is the moment when the soil is hinting us that we need to cover it up again. 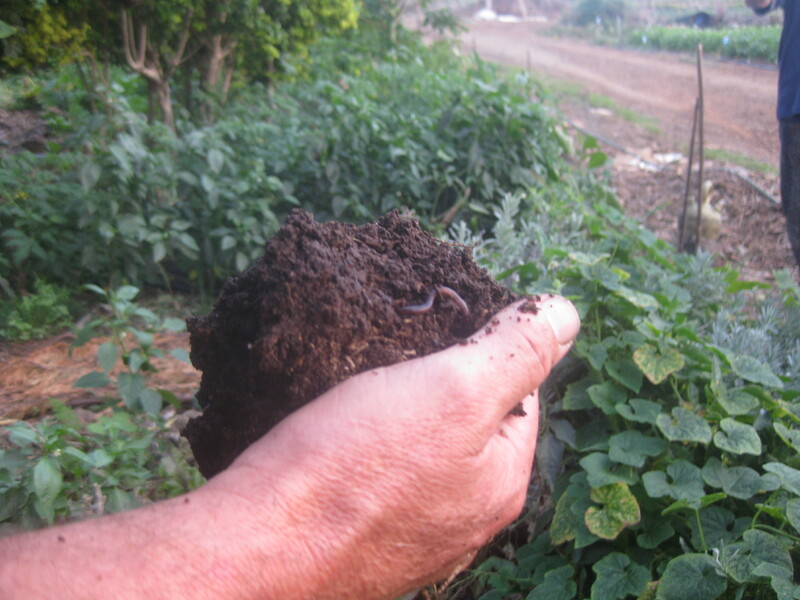 This is the moment we need to restore the soil´s skin with some type of organic matter that functions as a cover. 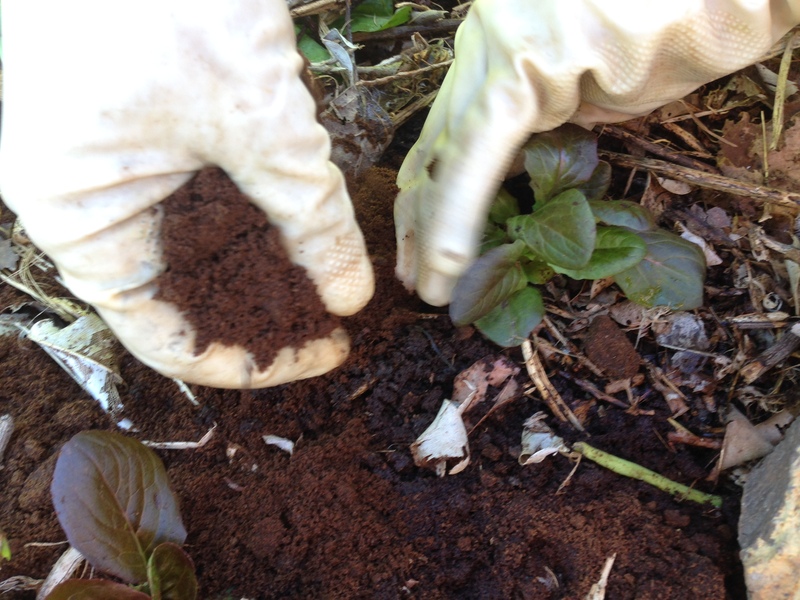 When available, we first add a thin layer of used coffee grounds, with an approximate thickness of 1 to 2 centimetres with the aim of covering the complete surface between the plants that we still have in the garden, so it is not necessary to pause the cultivating area in order to feed it. 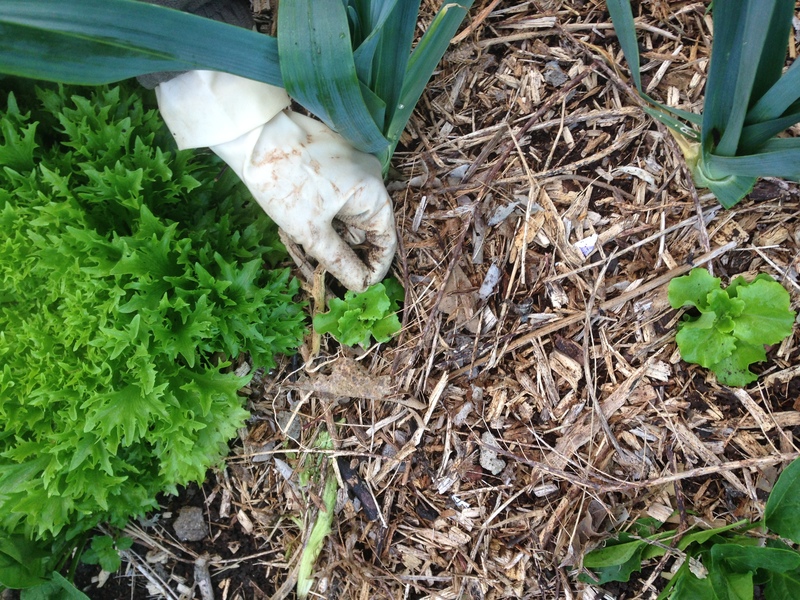 This task must be done with caution to avoid dropping used coffee grounds on to the plants (Figure 5.2). 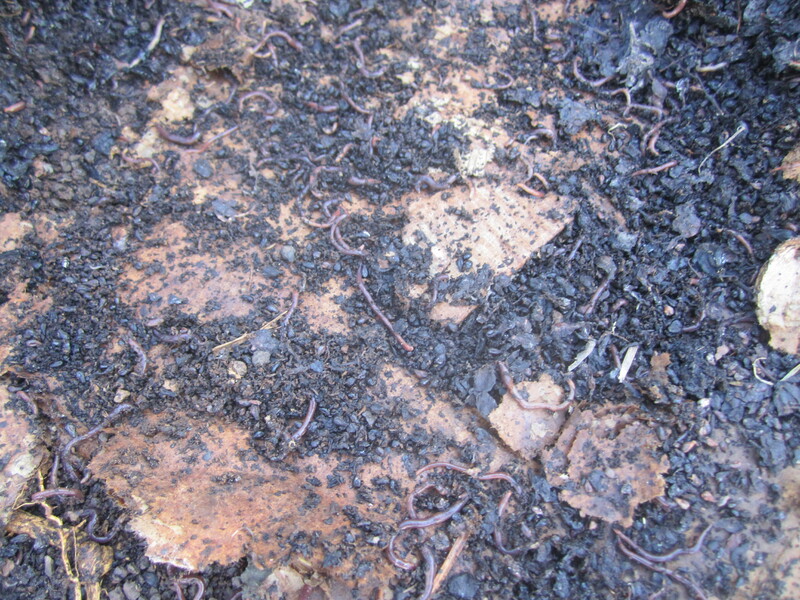 Since used coffee grounds are an organic residue, they act as nutrients that favour the recovery of humidity of the soil in case we’ve lost it, its sponginess and its appeal to decomposers, such as the earthworm, and the rest of the impressive fauna that exists in a soil like the one we propose, which are important allies that function as a multipurpose tool: they aerate, loosen and fertilize the soil. After covering the soil with used coffee grounds we have the great opportunity to directly sow in situ, using the broadcast seeding technique. This method consists of spreading the seeds by hand over the used coffee grounds, trying to avoid getting them too close to each other, although if this happened they could be removed afterwards when the seeds sprout and they have grown enough to thin them. The participants can use a glass jar to carry a mixture of seeds of their own choice to spread them, such as Swiss chard, green beans that fix nitrogen, small edible flowers, melliferous plants like marigolds or tagetes, arugula, radishes, sunflowers, etc. (Figure 5.3). After the broadcast seeding, we need to cover the soil with the organic matter we have available, carrying it with buckets. 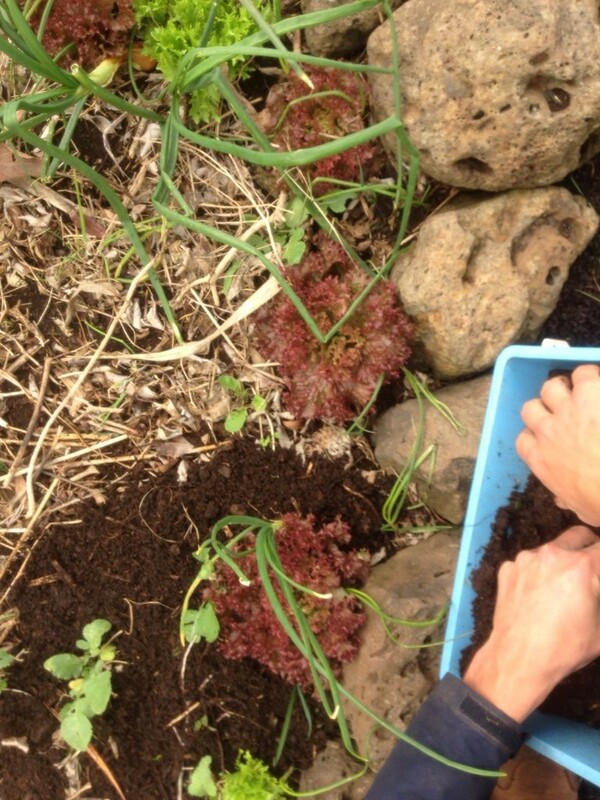 We will cautiously spread the organic matter around the vegetables, trying to avoid dropping it on top of the plants. To do so, we protect the plant with one hand while the other hand spreads the organic matter over the seeds and the used coffee grounds until the whole area is covered (Figure 5.4). 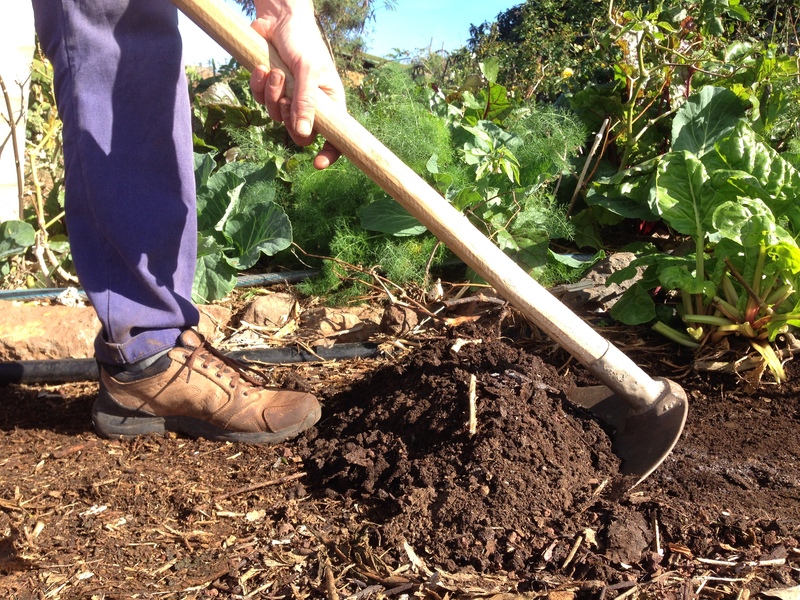 The layer of organic matter we need to place on the soil is approximately 5 centimetres thick, two or three fingers thick. We need to bear in mind that after wetting the organic matter its thickness will be halved, making it easier to plant (Figure 5.5). The sprouting and growth of the seeds is always a pleasant moment for the people who have participated in the activity. Now they can observe the edible creativity in which they have been involved (Figure 5.6). With this first maintenance of the soil’s skin, there should be no need of putting newspapers or cardboard again before applying the organic matter. 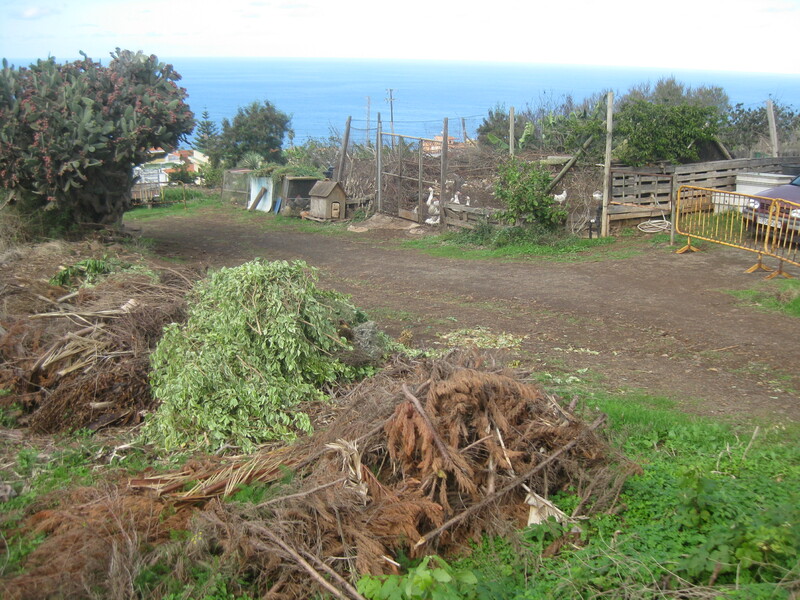 The only case, in which we would apply newspaper or cardboard again, would be when we notice a lot of invasive plants in the cultivating area and we would want to control them, as it was explained in the Didactic unit 3. 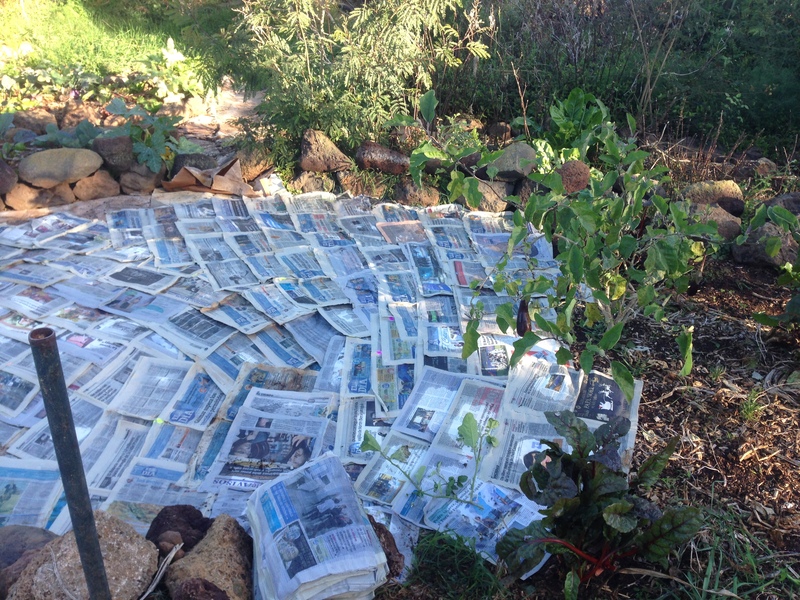 As we explained, if we have to apply newspapers again, we would have to stop the plot completely or partially, and by not doing so, it would take us more work to weed the invasive plants since they would grow again after a week (Figure 5.7). If we have large plants in the plot that we want to keep, or aromatic plants that we do not want to lose, then the newspapers must be assembled around the plants, as it was explained in the Didactic unit III, “Designing our edible garden”. 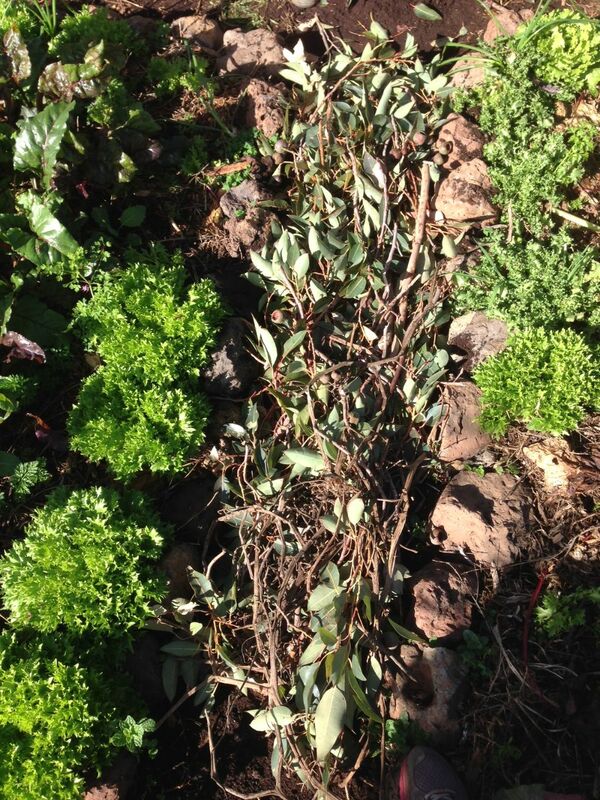 To avoid having to stop the production of the bed, it is crucial to control the invasive plants from the beginning by pulling them out in order to weaken them and to prevent photosynthesis so they don’t expand excessively. 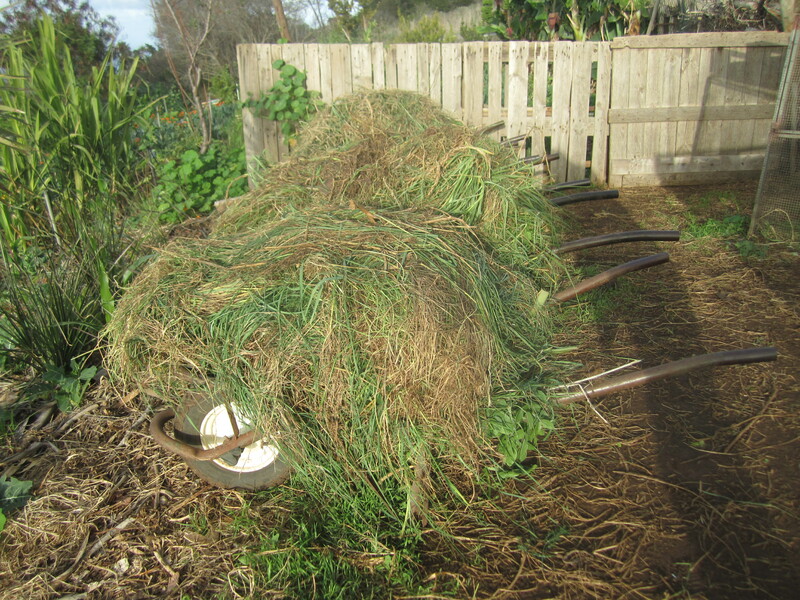 During maintenance, it is important for the cultivated area and the paths to be covered with mulch at all times: whether organic material from the farm itself (biomass from the trees, hay, vegetable waste, surplus from the biotopes, etc. 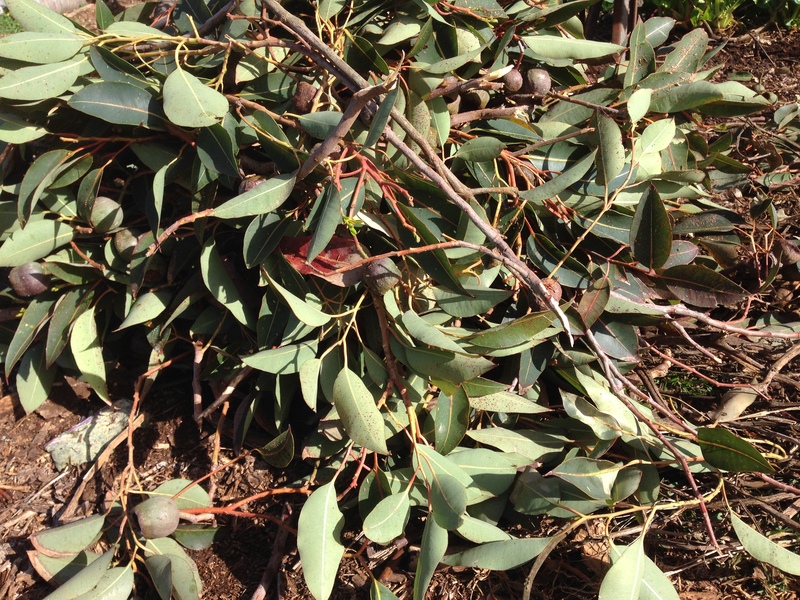 ), or resources that we obtain from the wastes-resources network that we have created (garden pruning waste, woodchip, etc.) (Figure 5.8). 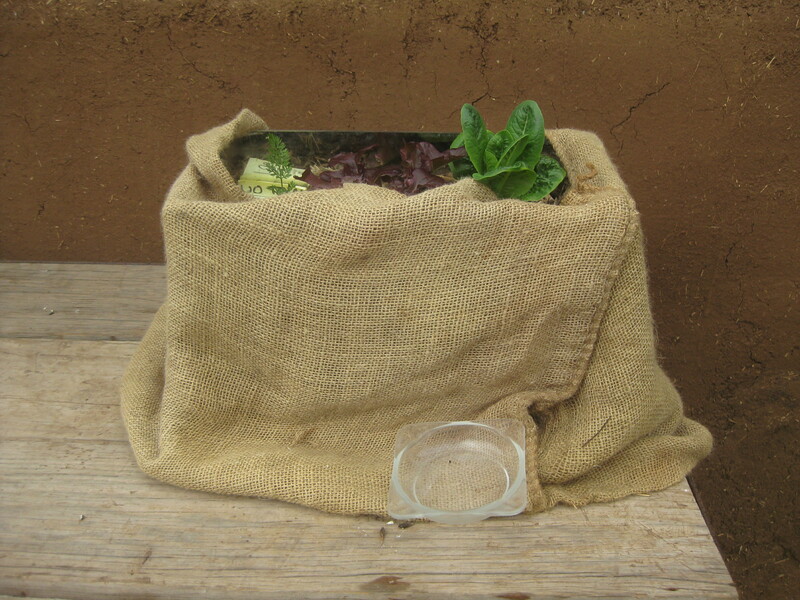 This cover is the soil´s skin, a cover that allows the soil to be fed by means of surface decomposition with the help of all the animals that live in the fertile soil, whilst maintaining its humidity at the same time and increasing the soil life because it protects from possible solar irradiation and frost (Figure 5.9). 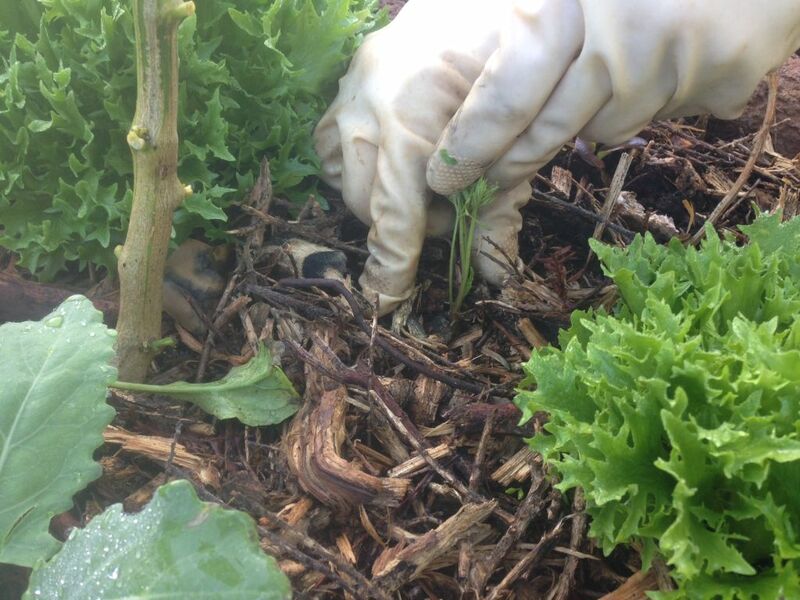 If possible, it’s advisable to rotate the type of mulch, for example, applying hay the first time and pruning waste the next time, since the nutrients from each type of mulch are different. 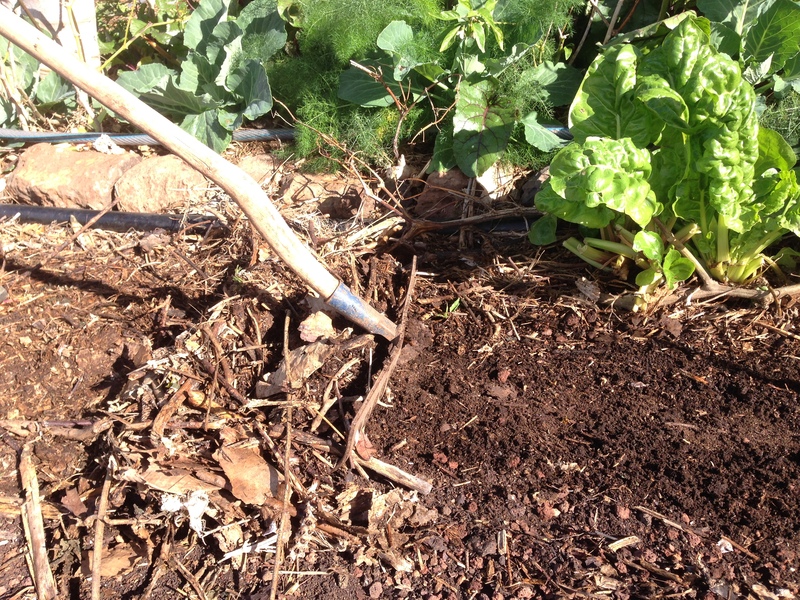 This technique of feeding and protecting the soil is applied once or twice a year depending on the intensity of the cultivation, the quantity of organic matter we add and the quickness of its decomposition. If we do not have used coffee ground, we can use substrate obtained from the cultivation of the paths, which we will discuss later, or as the last choice, we only add mulch. 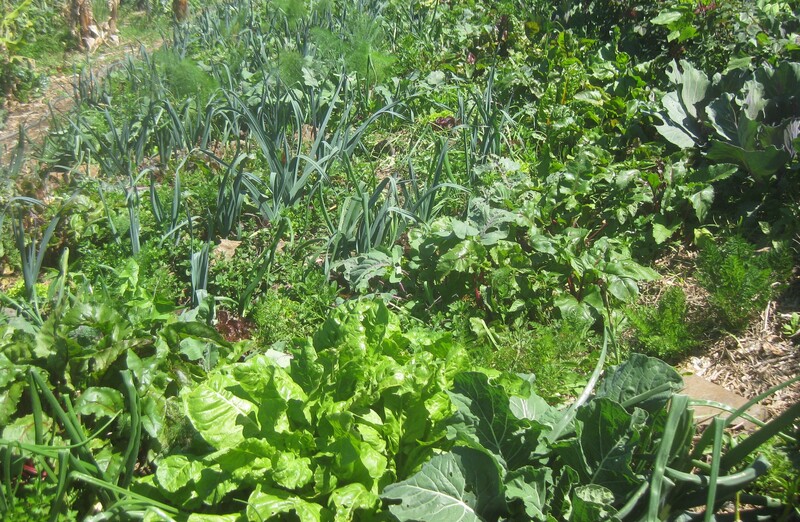 An optimal nutrition and protection of the soil creates the best conditions for a dense and a wide range of vegetables in the allotments. 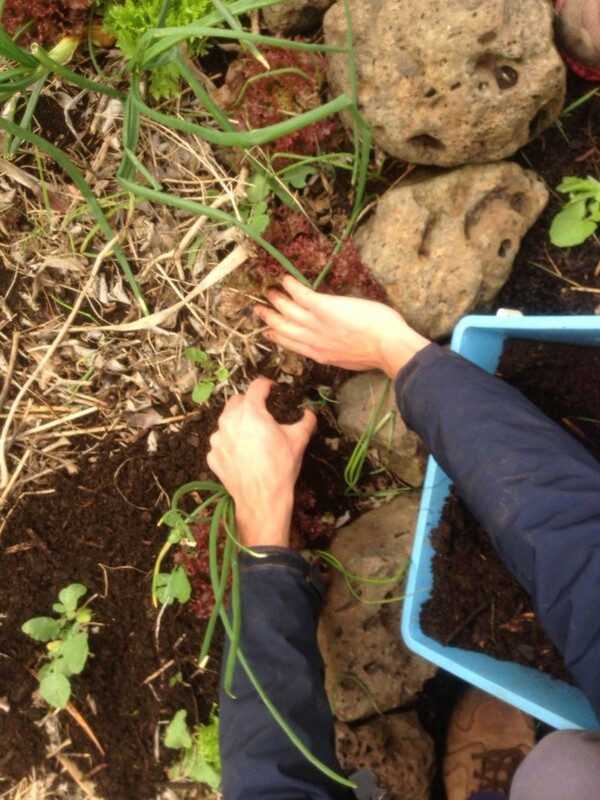 We can see and notice that the soil in our beds is spongy, which allows us to make holes to plant very easily. 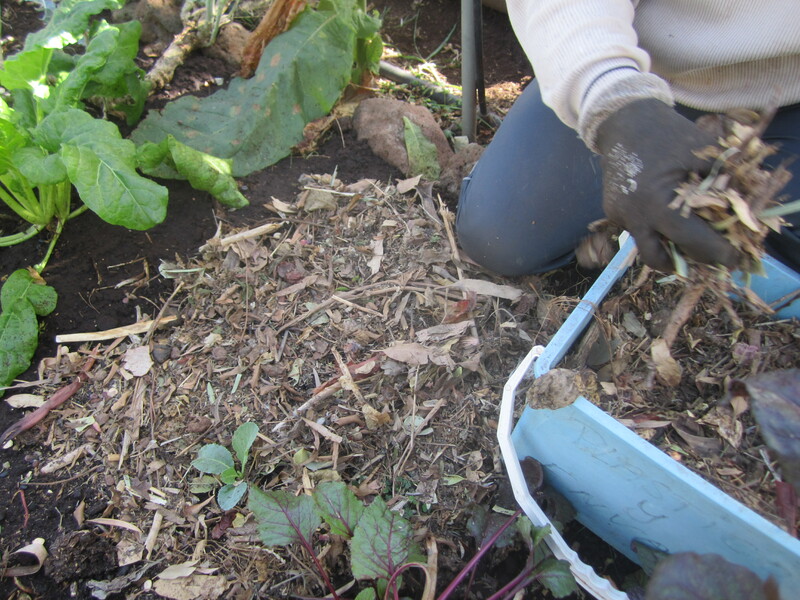 When we plant, we have to make sure we don’t drop any organic matter into the holes, just like we explained when planting for the first time with the newspapers and cardboard. 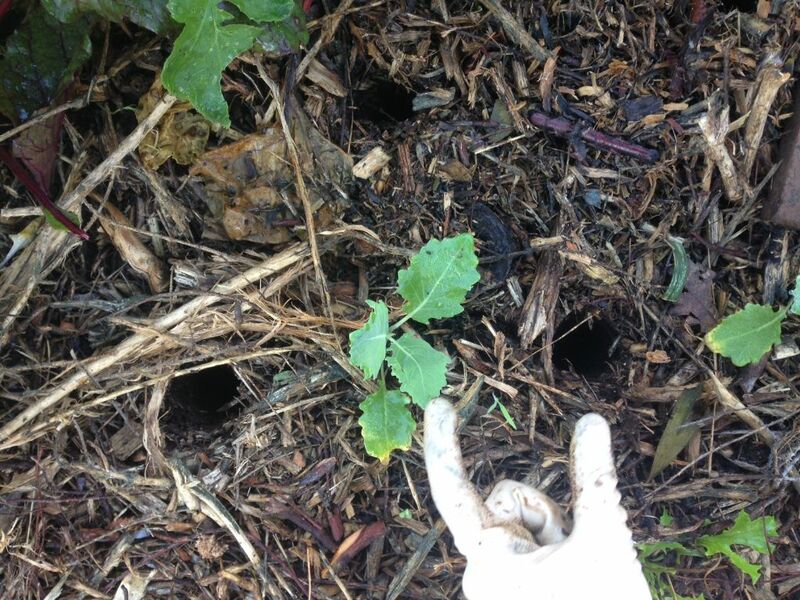 We do so by cautiously removing a bit of the organic matter before making the hole. We drop the seedling into the holes without pushing it. If we are planting carrots, radishes, or plants with similar delicate roots that require more caution when transplanting them, we dig a hole twice as large as the cone of the seedling, or even a little deeper. 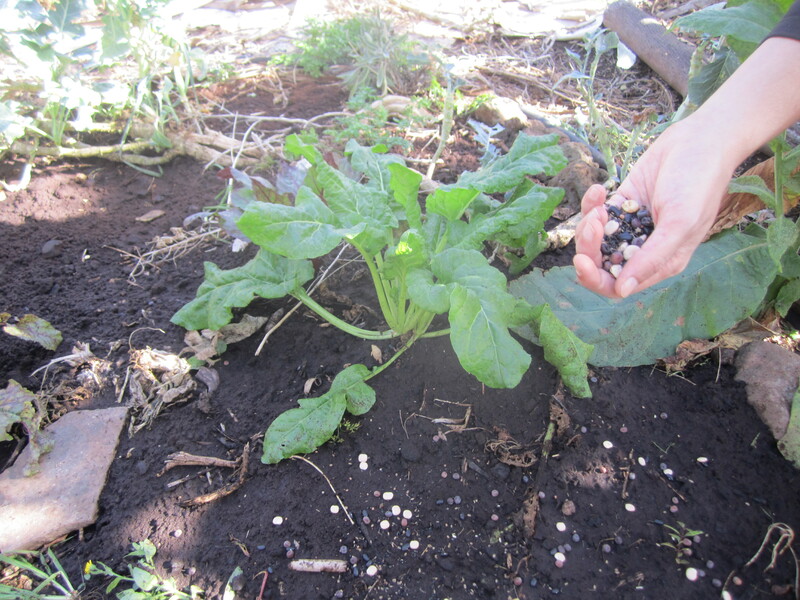 To attach the vegetable seedling and prevent it from dropping into the hole, we attach its upper part with our fingers by gently applying a light pressure without pinching it (Figure 5.11). By doing so, we make it easier for the vegetables to grow straight since they have free space available underneath the roots of the seedling. 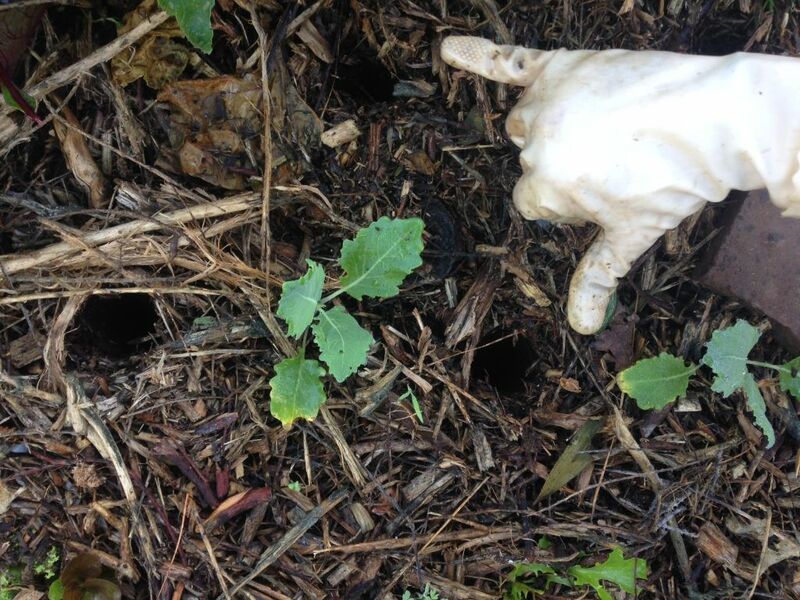 In order to keep the edible gardens and garden forests constantly productive and with a high density of vegetation we use the hole planting technique, which consists of filling out all the spaces that have been created after harvesting the vegetables. 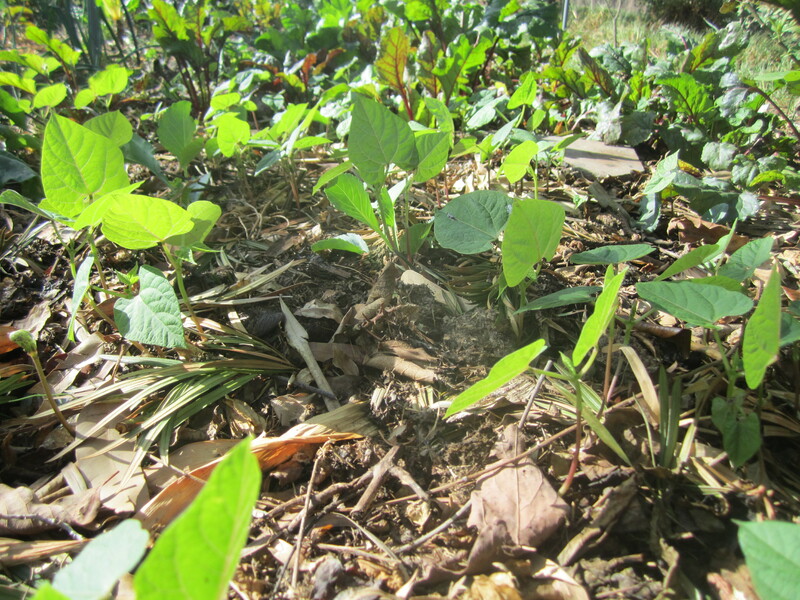 In these spaces, we plant new seedlings without worrying if they are from the same variety that we have just harvested. 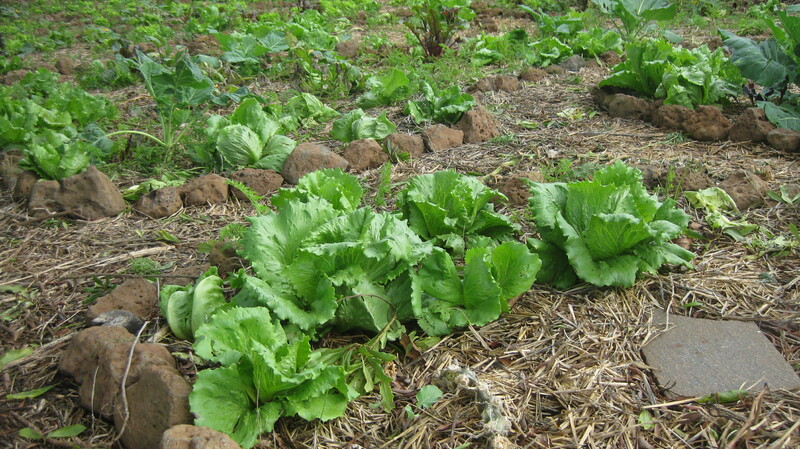 We do not use the crop rotation technique in this cultivation system since we have a permanent healthy soil that’s being cultivated with the previously explained surface composting process, a soil with enough nutrients for all the plants. With this soil and the hole planting technique we ensure replacement and succession of the vegetables. When we are using the hole planting technique to plant the same type of vegetable we must take the planting distance into account, which is the space we need to leave between the plants. In this case we use the triangle pattern technique, which consists in planting the same type of vegetables in a triangle or pyramid. 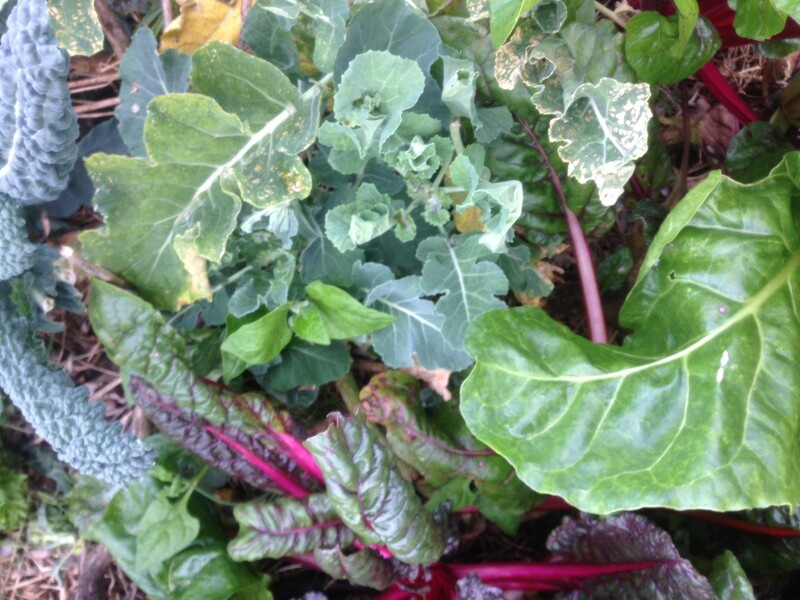 We do not have to consider the planting distance when planting different types of vegetables. For instance, when planting carrots we need to do it with a planting distance of 20 centimetres approximately (one handspan), but if the carrot seedling were to be next to a kohlrabi and the planting distance is between 5 to 8 centimetres the carrot will not obstruct the growing of any of them because the carrot is a tuber that grows downwards, and the kohlrabi grows sidewards and upwards (Figure 5.12). By combining the hole planting and the triangle pattern techniques we manage the cultivating space more efficiently since it allows us to plant as many vegetables as possible, and therefore to take maximum advantage of the available space (Figure 5.13). This method allows the people we work with to put great effort into concentrating and caring through observation. 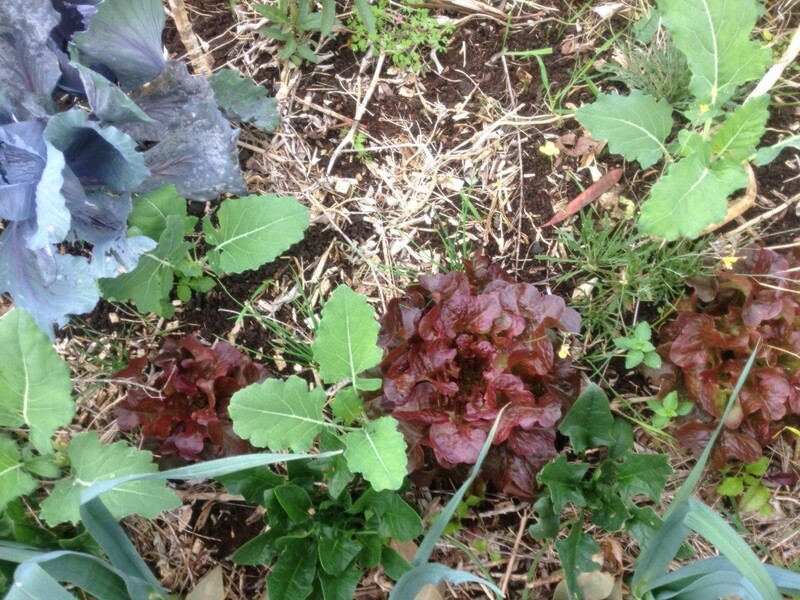 Since our edible gardens and garden forests are constantly producing, there will always be, simultaneously, spaces where the vegetables have just been harvested, vegetables that are ready to collect and others just halfway their growth. 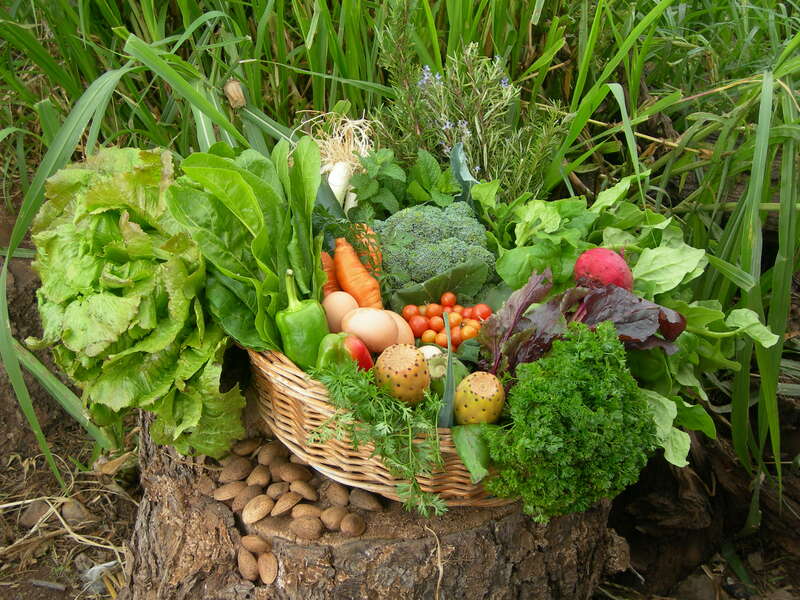 This way, we can maintain the succession harvesting of the vegetables. 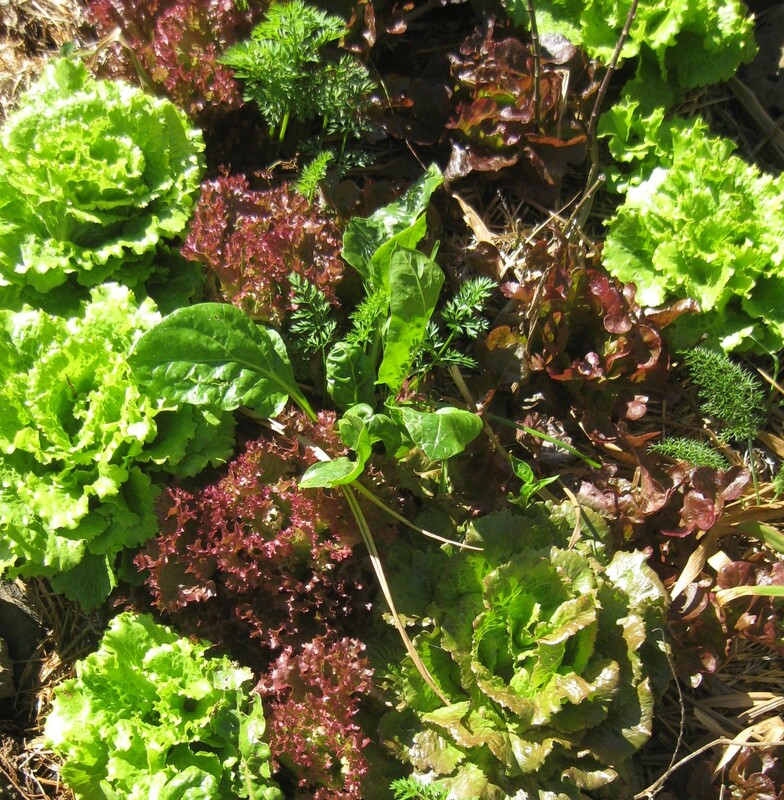 In order to give a clear visualization of this succession, we use the cultivation and harvesting of lettuce as an example: we plant the lettuce next to the one that is about to be collected so that after we cut the lettuce, the new one has space to grow (Figure 5.14). 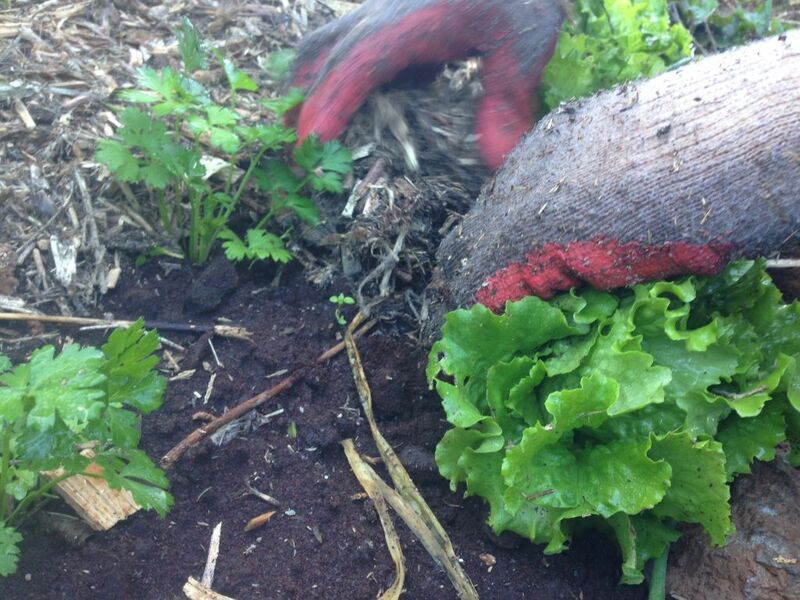 We continue doing this with the lettuce and with any other vegetable. 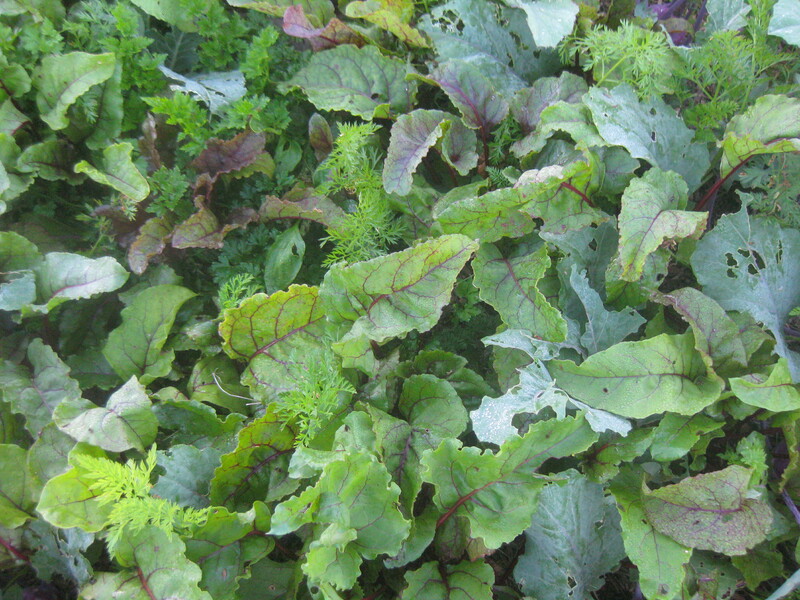 Some plants, such as lettuce, kohlrabi or Florence fennel, must be cut and not pulled out, so their roots can be left in the soil and form part of the decomposition process. Due to our experience we know that we can combine up to 20 or more different species of vegetables in one bed without having to think about the combination of different crops since there is no competitiveness among them when there is good fertile soil. 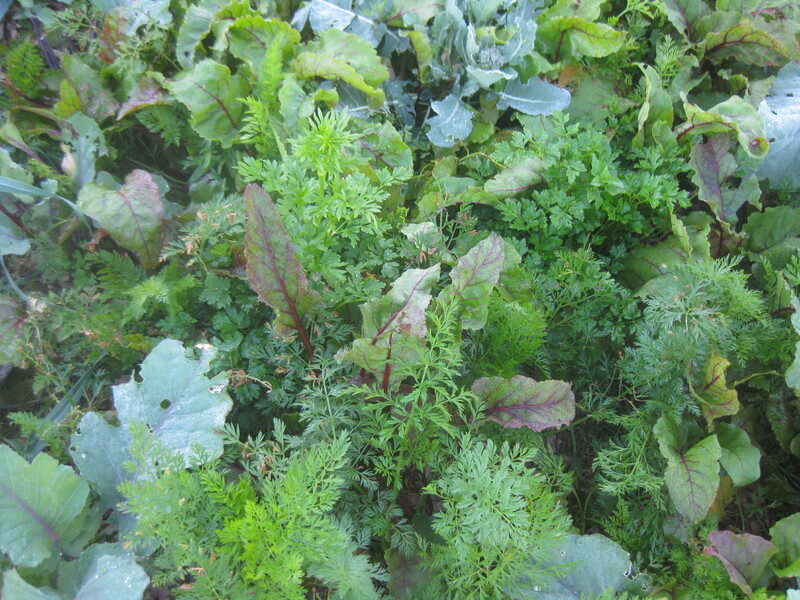 Maintaining the allotments with this vegetable density ensures a continuous production and commercialization. It also attracts all possible life into the area, creating the perfect conditions to obtain a natural balance of plagues and predators that secure healthy vegetables, plants, bushes and fruit trees. 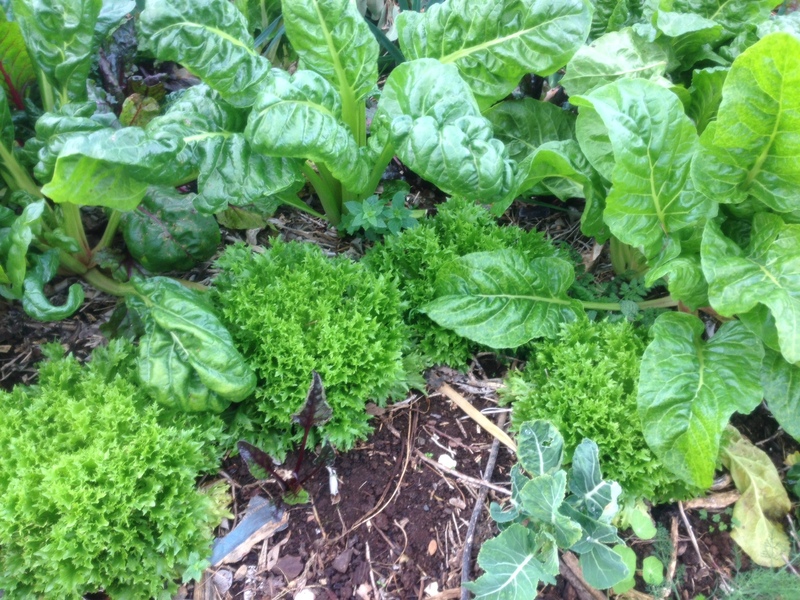 In case we detect an occasional small plague or disease in a vegetable or plant, we do not have to intervene because the existing balance of our edible garden does not allow the plague to expand from one plant to another (Figure 5.15). It is better to observe than to act. The information that we receive by observing the plants tells us that the soil might not be completely balanced in this spot and that we have to wait until it balances itself. And, if we needed to act, it would only be by giving more nutrients to the soil. 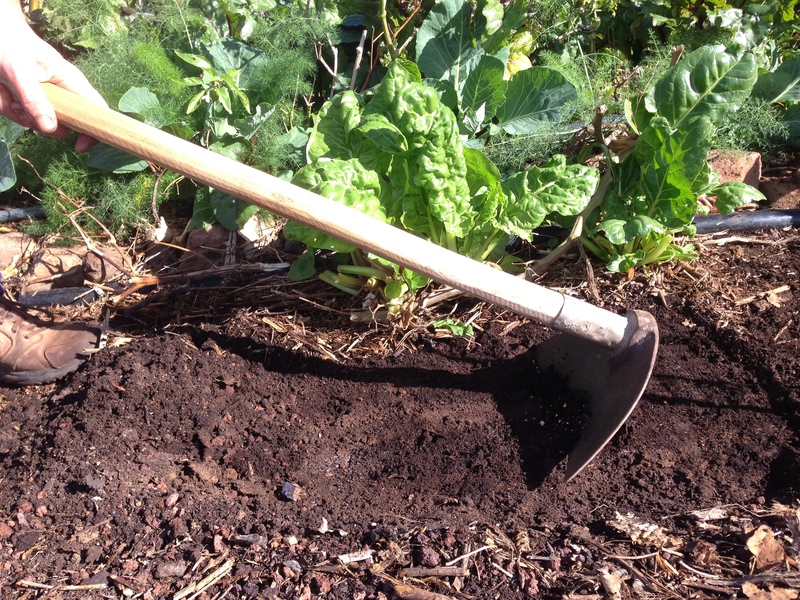 As we never plough the soil in this cultivating system, the layers of the soil aren’t disturbed. 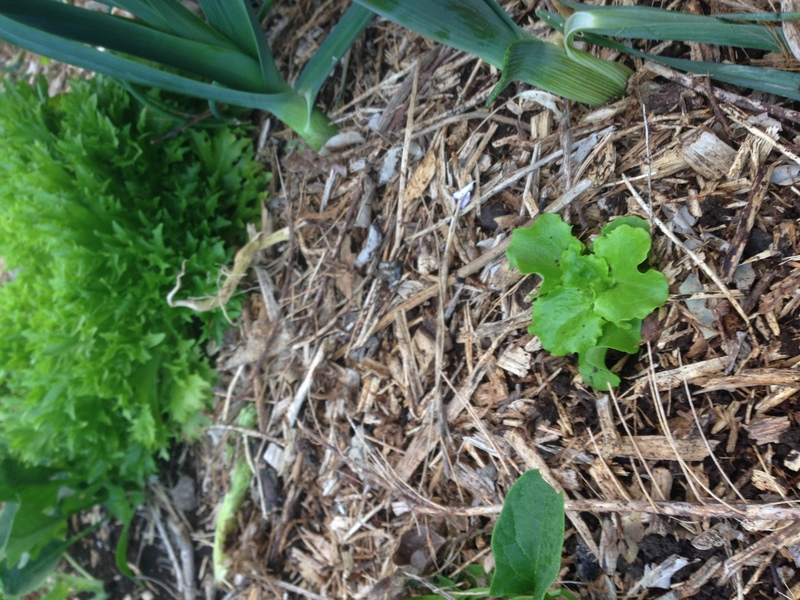 This has the great advantage that every time less and less bad weeds germinate. 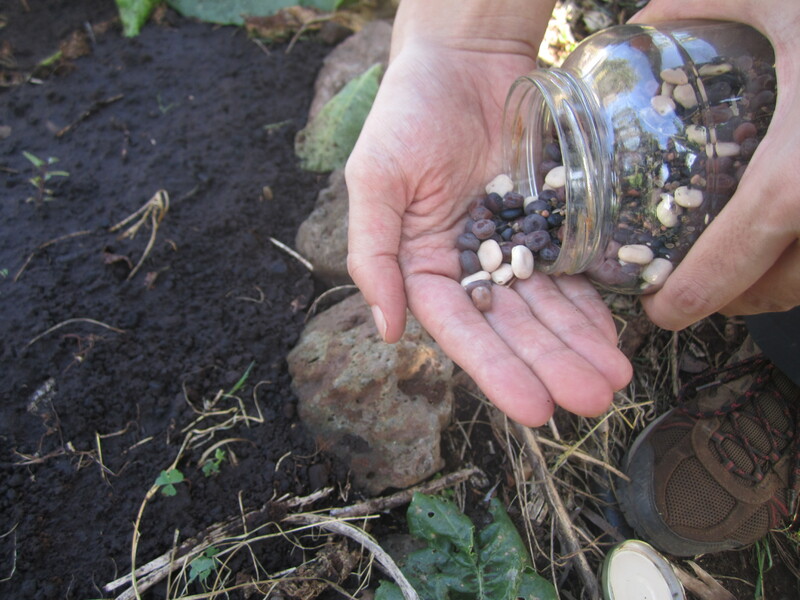 It is true, however, that seeds brought in by birds could also sprout, but, as we discussed before, if we have a diverse and dense cultivation of vegetables in the beds, only be a minimum amount of seeds will sprout due to the lack of light that reaches the soil (Figure 5.16). 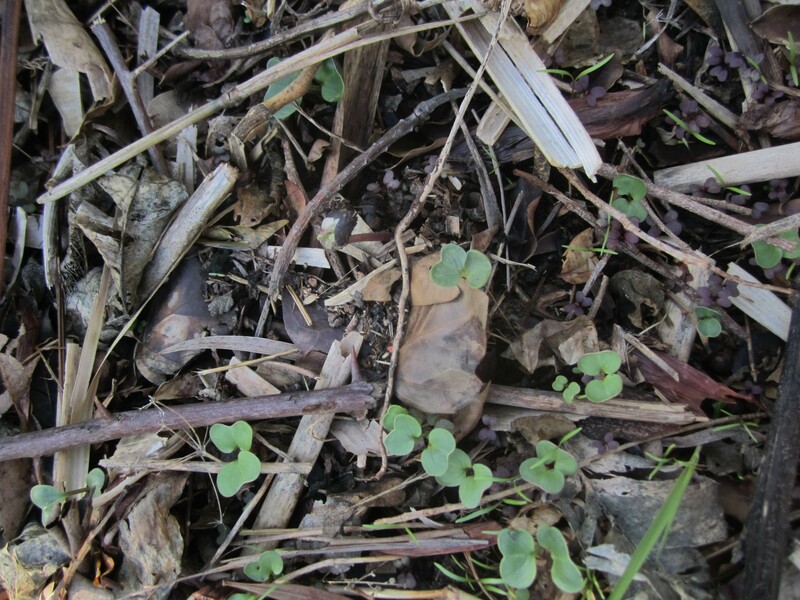 These few weeds can be controlled by pulling them out and leaving them as mulch. 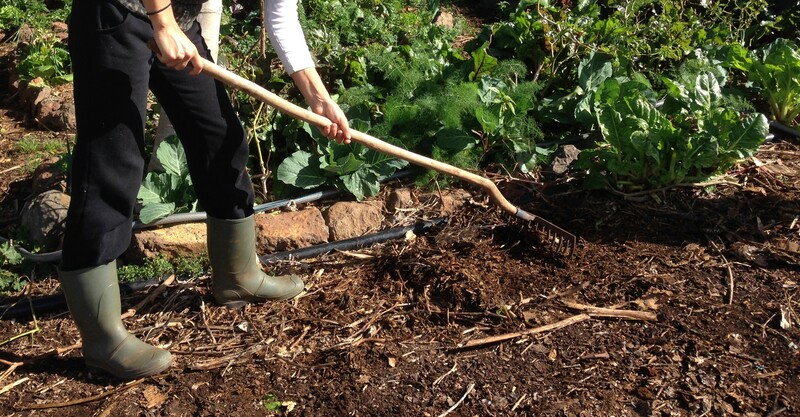 This is a task everybody can do whilst planting, harvesting or just going for a walk. This maintenance task is a perfect activity to involve the people from the project. It is an opportunity for them to learn how to identify the moment when the soil´s skin needs to be restored and how it is fed by doing so. 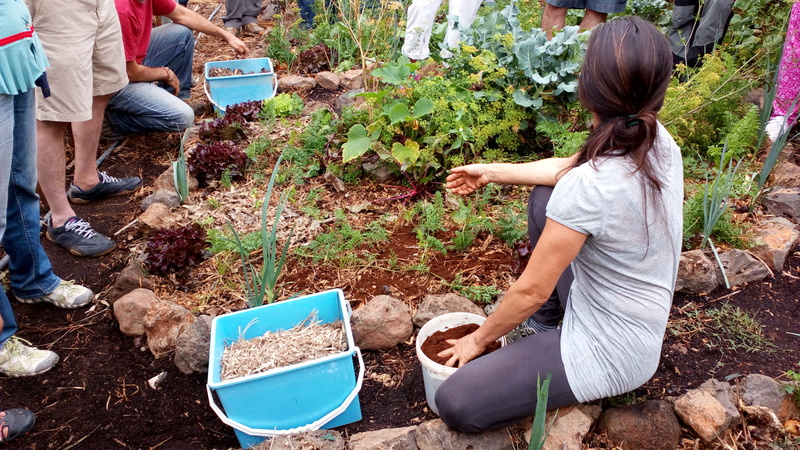 To summarize, with this fundamental maintenance task, not only are we cultivating the soil, but we are also cultivating our observation and our attention whilst indulging and protecting our edible gardens and garden forests. 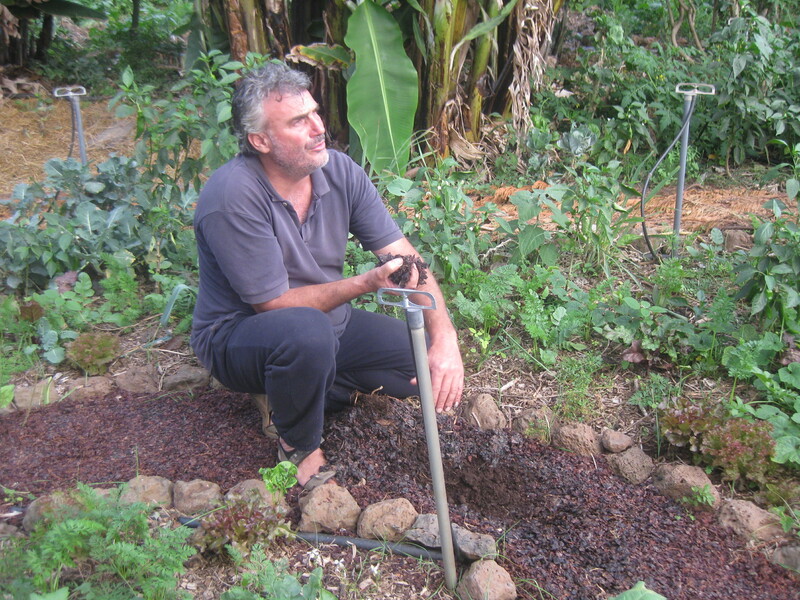 The people involved in the project can take part in a playful activity; an interesting activity to understand how the cultivation and maintenance of the soil works, and with the purpose of emphasizing the relevance of these two processes of cultivation and maintenance, and of that of the protection and indulging of our edible garden and garden forest. The aim of this activity is for them to get to know the soil’s layers and the functioning of a living soil in a visual way. 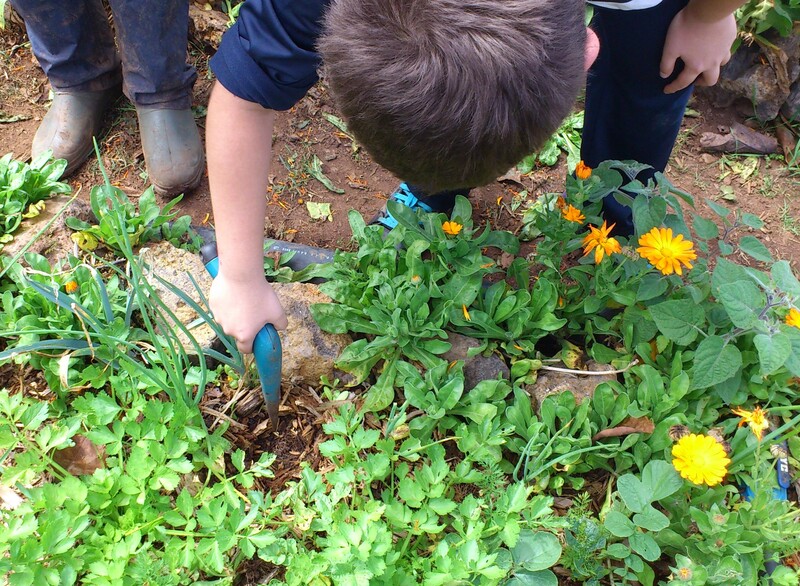 The required materials for this activity are: a fish tank, recycled if possible; small rocks (with an approximate size of two to three centimetres); soil; compost with earthworms; used coffee grounds; and some type of mulch. We involve the people of the project to participate in this activity so that they collect the materials that they are later going to spread out into layers in the fish tank: a first layer of 5 to 8 centimetres formed by rocks that will function as drainage, as well as a representation of the rock layer of an area; a second 10-centimetre layer of soil; upon which we add a third layer of 10 to 15 centimetres of humid compost with earthworms; on top of the compost we spread out a fourth 1-centimetre layer of used coffee grounds; and finally, we add a fifth surface layer of 5 to 8 centimetres with some type of mulch. These are approximate measures; they should be calculated proportionally according to the height of the fish tank. Once the fish tank has been filled out with the listed layers, we plant different varieties of seedlings such as lettuces, carrots or radishes, plants that do not get too big when they grow. We plant some of the seedlings next to the glass in order to see the roots grow. We also add some seeds next to the glass so we can observe how they sprout and see their roots through the glass. We have to take into account that one of the conditions of a natural soil is total darkness, so we need to cover the glass of the fish tank with cardboard or some other material to make the glass opaque. However, the plants do need light, so we will place the fish tank in a bright spot. We will only remove the cardboard from the glass when we are doing an observation activity (Figure 5.17). Making sure the roots of the seedlings can grow in the required conditions isn’t the only reason why we cover up the fish tank: in order to do their job, the earthworms need darkness too. When we uncover the fish tank we can see them move through the tunnels they built, which are easier to see if the worms work next to the glass (Figure 5.18). We water the fish tank slightly in order to maintain its humidity, while observing through the glass the infiltration process of the water through the different layers, controlling the quantity of water we add in order to avoid water logging. 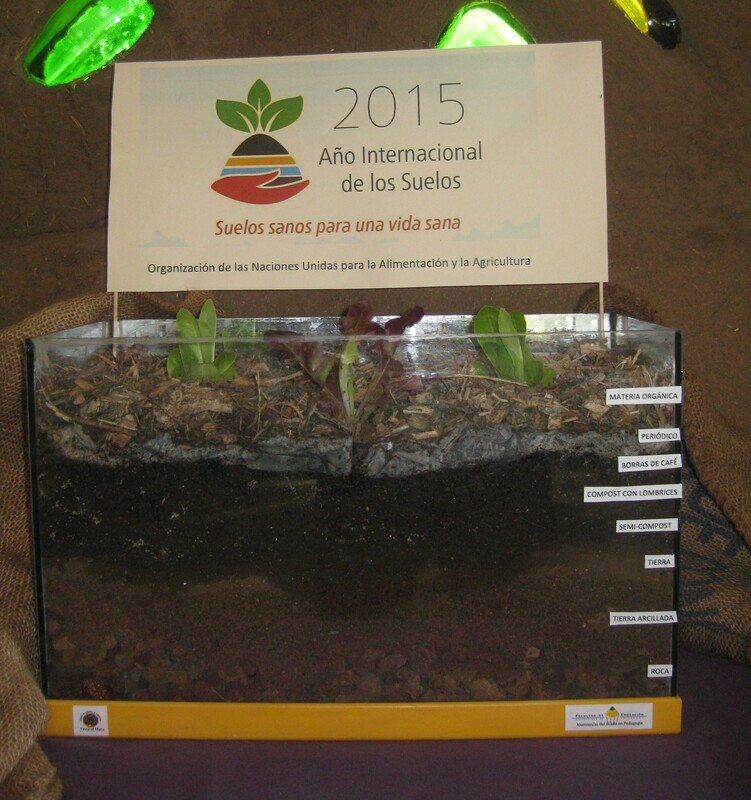 We will maintain the cultivated soil the same way as it was previously described in the section “The soil´s skin”. As time goes by we can notice how the colours of the different layers tend to unify due to the movement of life that exists inside the fish tank. To check the movement we can make moveable identification labels for each layer, place them at one side of the fish tank and move them according evolution of the layers and the behaviour of the soil (Figure 5.19). The paths are the roads that guide and connect us to the cultivating areas, while giving shape to our edible gardens and garden forests (Figure 5.20). They are just as important as the beds that we cultivate. They provide us with nutrients for the seedling trays in the greenhouse and contribute to our beds, hence the importance of its cultivation. 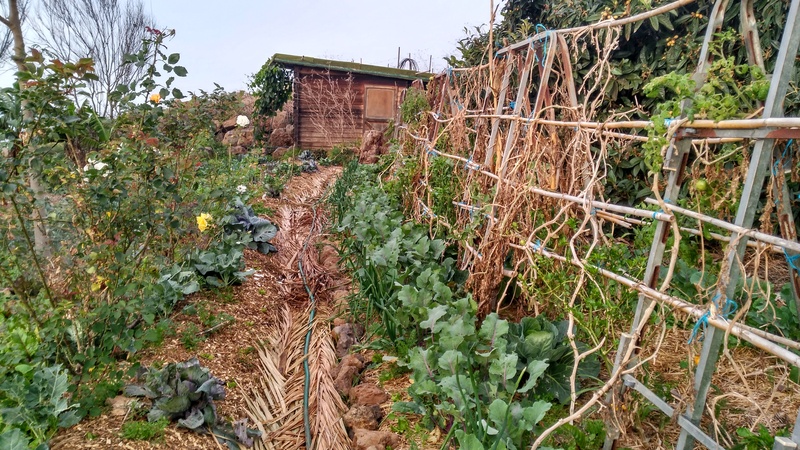 The paths also function as ecological corridors between the beds, which means that the soil´s life does not stop at the paths, in the contrary: it continues and is completely homogenous throughout the entire design of the edible gardens and garden forests (Figure 5.21). This is why we also use mulch to cover our paths, which decomposes and produces surface compost that is later transformed into mature compost. This is why our paths aren’t just simple roads: they are authentic paths of life. 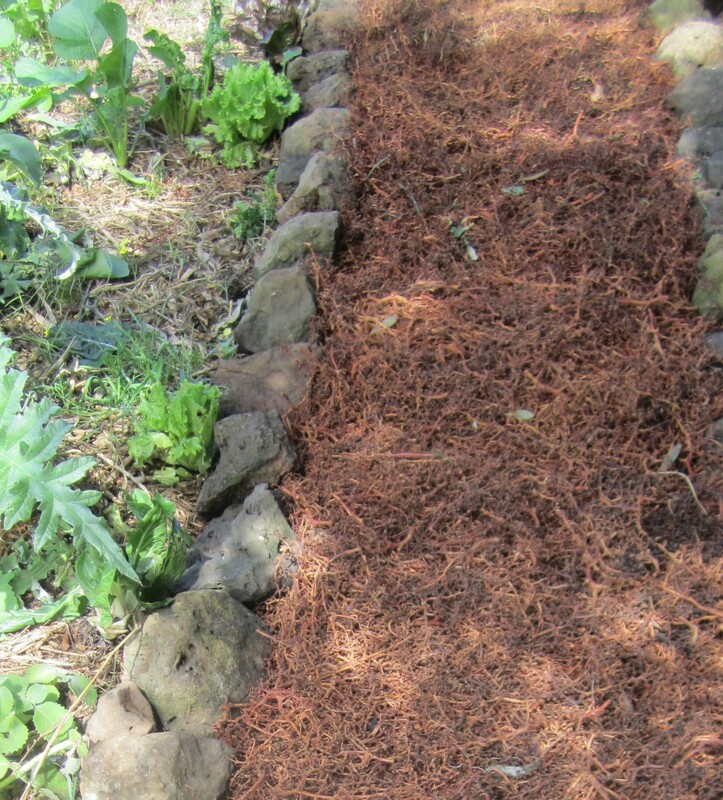 As the mulch of the paths is a vegetal cover, it functions as a sponge, which has the great advantage of absorbing the water when we are irrigating or, especially, in rainy seasons. This way it prevents puddles to be formed and us to get dirty with mud after watering the plants and therefore making it easier for us to sow, plant, harvest, etc. (Figure 5.22). This type of mulch gives us the opportunity to make the people we work with discover the sensation and delight of walking on a spongy path when it is raining, and to simultaneously listen and feel the raindrops. We carry out this activity with the appropriate attire, such as good quality boots and rain jackets, to protect us from the rain and cold. After the first year, almost all the organic matter that we added onto the paths will have decomposed. Before covering it again we remove all the mature compost. If we notice there is still some coarse organic matter that has not yet decomposed, we rake this part and move it aside (Figure 5.23). One person could do this task alone, but we recommend doing it in pairs with the people we work with, since it promotes gender equality, team spirit, and working skills with tools such as the hoe and the shovel. With the help of the instructors, it’s also a good opportunity to pay attention to correct postures and to concentrate on good and correct breathing. 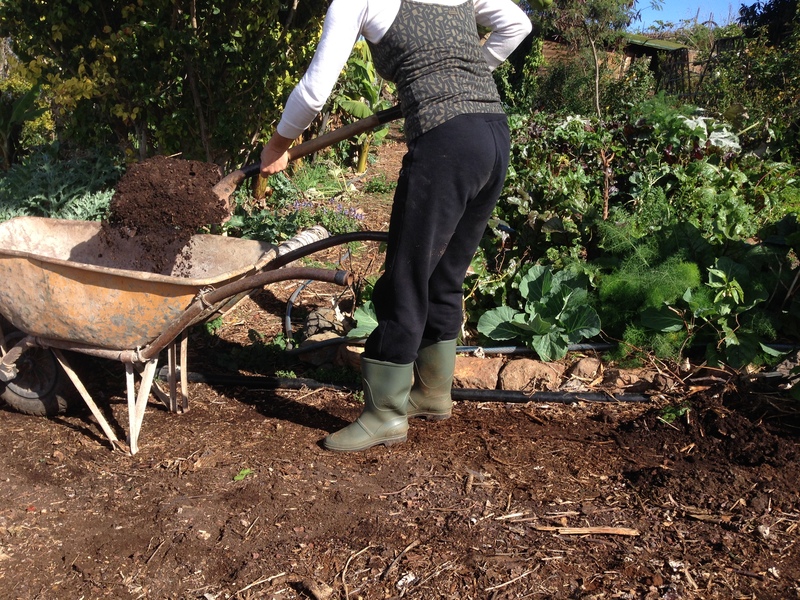 With the use of a hoe, a shovel, a wheelbarrow, and without too much effort, one person scrapes off the top layer of compost and makes small piles so the other person can shovel it up and fill the wheelbarrow, that once fully loaded, is carried to the greenhouse, where it can be used to fill the seedling trays, for the cuttings, to transplant,… (Figures 5.24 and 5.25). We have to keep on scraping until the brownish colour of the earth starts to appear, a colour that is different from the colour of the compost. Once the compost of the paths has been extracted, we use organic matter to cover the paths again, starting from one side and gradually covering the entire path. 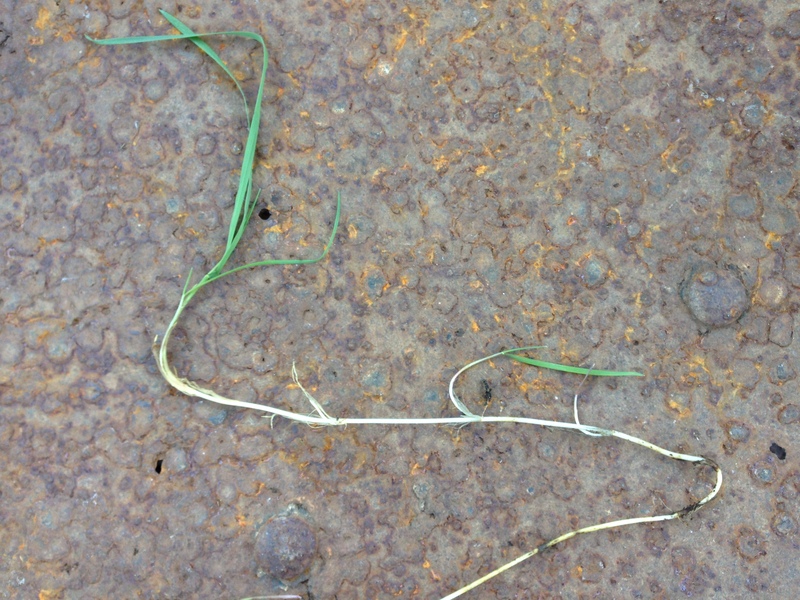 An indicator of how much organic matter we should add to create good quality substrate is provided by some functions of the path: the fact of walking comfortably on them without getting muddy in case of heavy rain, and of ensuring the optimal conditions to generate a large quantity of surface compost on the paths. The path is a permanent source of mature compost that’s constantly generated with materials that we cannot use as organic matter in the beds. The renewal of the soil of the paths is done progressively when the path requires it, by adding organic matter just like we did in the beds. Depending on the type of organic matter we have added there is a difference in decomposition rates that varies from 6 months up to one year; the weather conditions of the area also have an influence on the duration of this process. As we pointed out before, we use the coarsest or most ligneous organic matter we have available as mulch for the paths, organic matter we can easily step on. 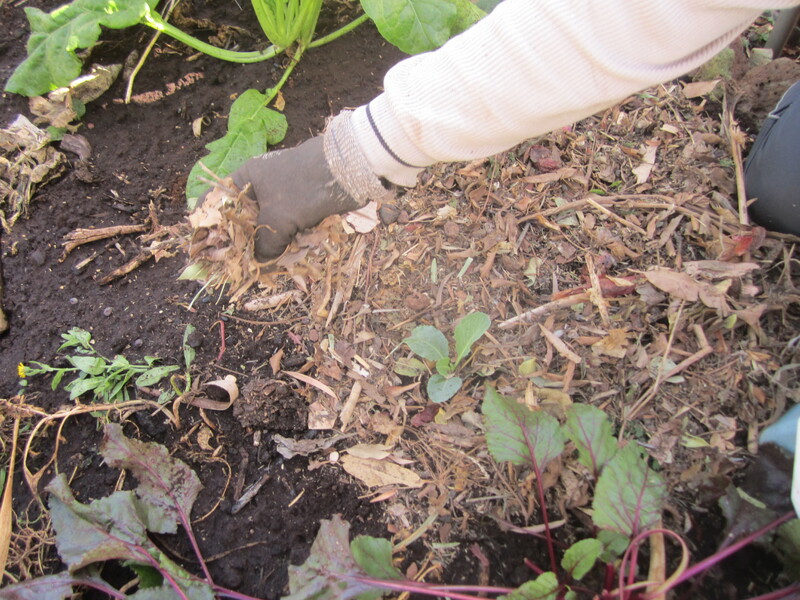 This material is not appropriate as mulch for the beds because of its coarseness and long decomposition period. 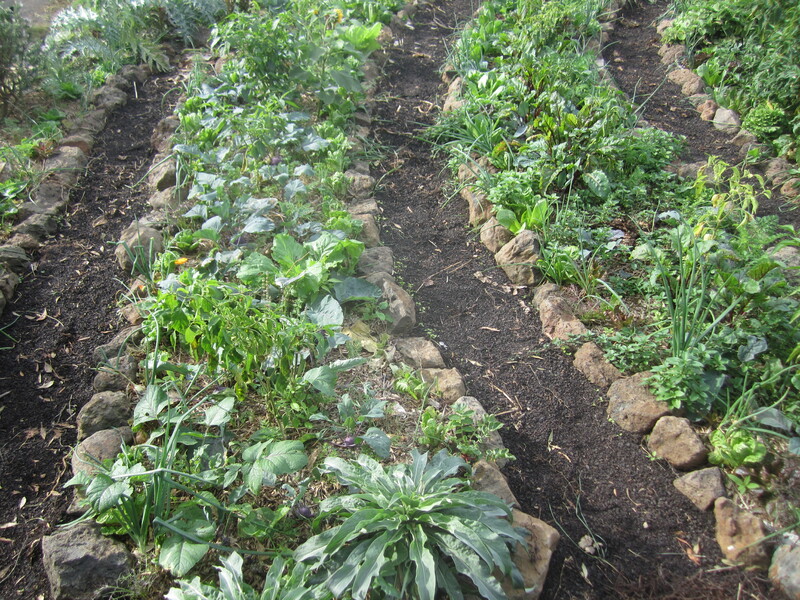 By using this material on the paths, we don’t hinder the cultivation of the crops in the beds. 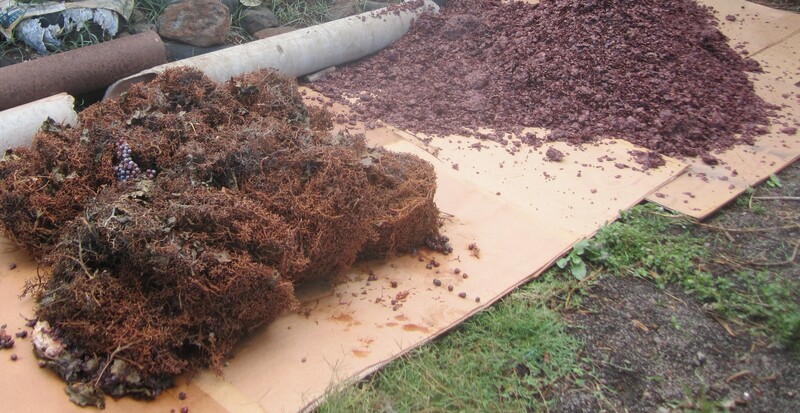 Other ideal types of mulch for paths are the ones with a higher acidity, such as pine needles, eucalyptus pruning, winery waste (grape pomace – seeds and stems), or other types of cover like the shells of some nuts, such as almonds, walnuts, olive pits, etc…(Figure 5.26). 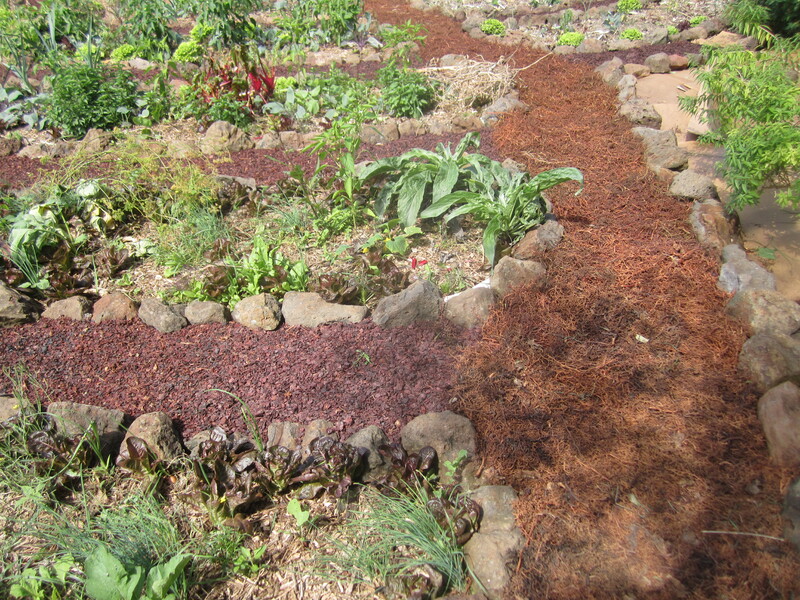 The substrate we have obtained from the paths can also be added directly on to the beds the same way as it was previously described for the used coffee grounds, with the small difference that now we can add more quantity (Figure 5.27). In this case we directly fill buckets or wheelbarrows with the substrate in order to use it on the adjoining beds or where it is most needed. The way we cultivate our paths demonstrates the importance of the sprinkler irrigation system, that is the most similar to rain, as explained in the Didactic unit 3. With this system, we do not only water the beds, but we also include the paths, ensuring a uniform humidity over the entire plot and creating ecological corridors. The sprinkler irrigation system is designed to water the entire plot, both the cultivating area and the paths (Figure 5.28). The drip irrigation system can be combined with the sprinkler system in case of water-use restriction in a certain season of the year, but we recommend always using the sprinkler irrigation system since it maintains a permanent decomposition in the entire edible garden, a decomposition that produces nutrients in the beds from which we obtain produce, and in the paths from which we obtain good quality compost. In order to know when to irrigate, we can touch the soil to check its humidity, which will fluctuate depending on the area and the season of the year. In any case, it is important to take into account that the best time of the day to irrigate by sprinkling is in the morning or the evening in order to prevent the sun from burning the leaves of the plants. We can irrigate in the midmorning if the day is cloudy or if we use the drip irrigation system. The moment of extracting the substrate is an ideal time for the users to show the visitors of the project the potential of an area that at first sight seems unproductive, so they can say to the visitors that they are walking on authentic paths of life (Figure 5.29). Cultivating the paths with the appropriate irrigation provides us with several functions: comfortable and accessible paths at all times, ecological corridors, substrate for our greenhouse, nutrients for the beds and therapy for the people we work with that can comfortably walk through the edible gardens and garden forests. 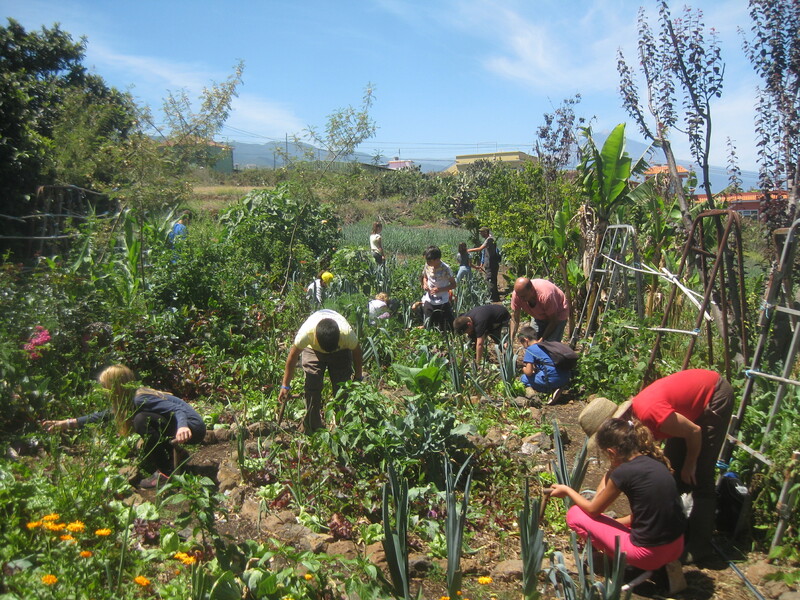 An optimal maintenance of the soil, including important elements such as the biotopes or the pollinator volcano, which we have discussed in Didactic unit 2, ensures biodiversity in our edible gardens and edible garden forests. 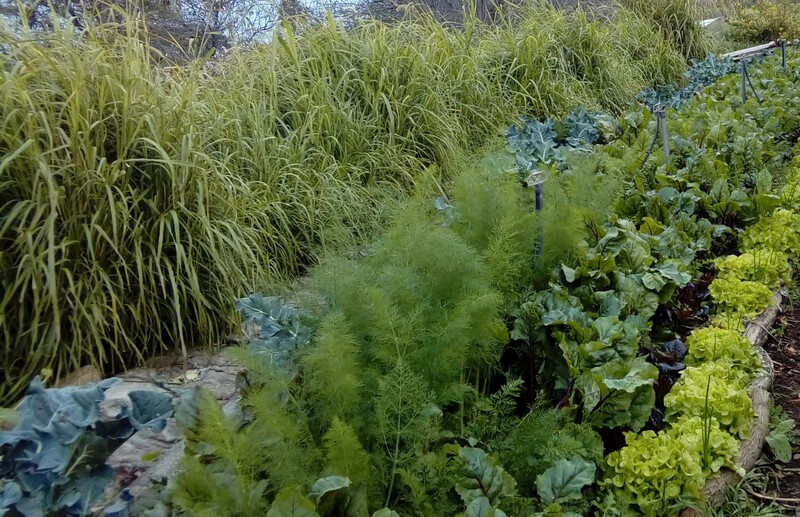 Except for areas with harsh winters, these edible gardens and garden forests produce all year long due to the high quality soil we obtain by maintaining it alive and nourished. 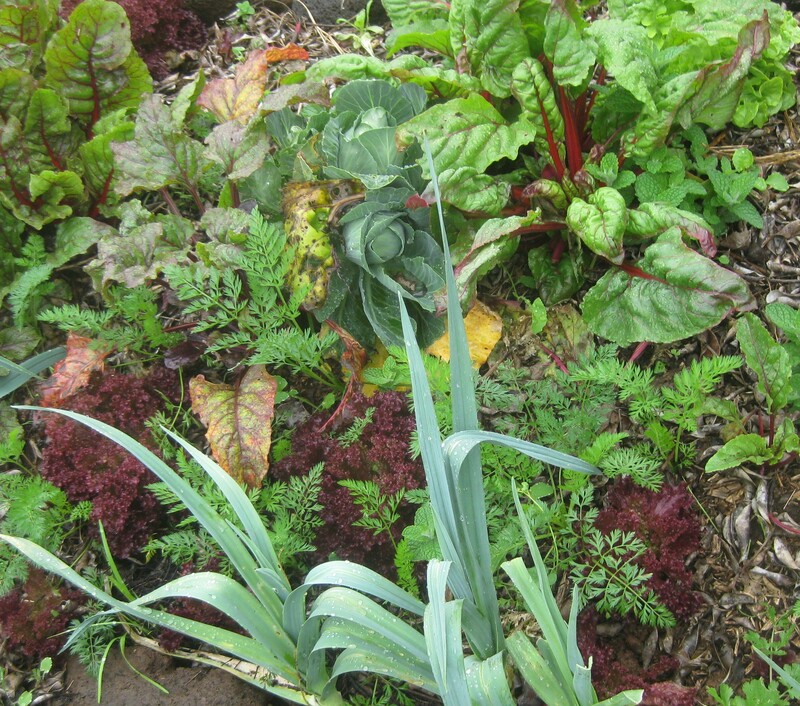 Edible gardens and garden forests are cultivated ecosystems that are balanced by their own biodiversity: a biodiversity that gives shelter to many species of predators that help us to control plagues and where we cultivate healthy food and develop good mental health (Figure 5.30). 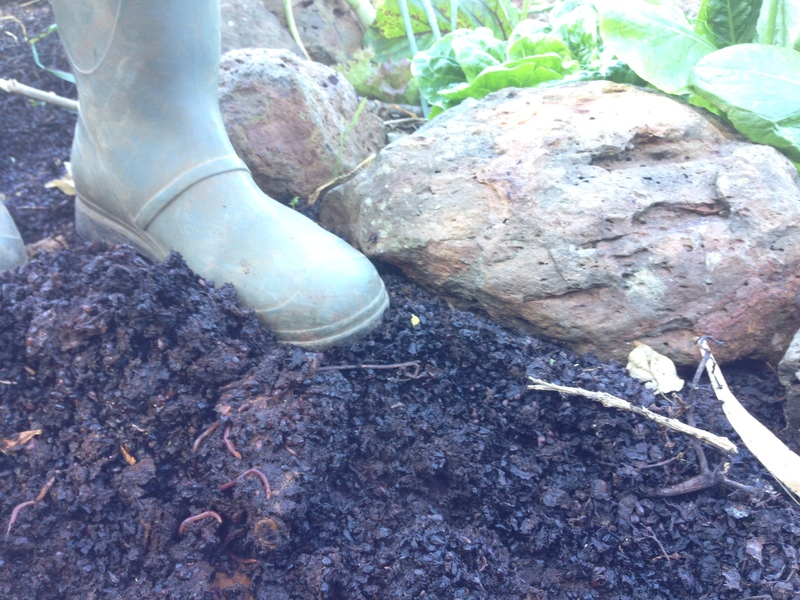 We compare the balance of a healthy soil with that of our own immune system.